Canon continues to innovate and develop image acquisition products for the most demanding professional. The Canon XF300 Professional Camcorder features 50Mbps MPEG-2 4:2:2 recording to Compact Flash (CF) Cards for unsurpassed image quality and efficient, robust workflow at an affordable price. It is ideally suited to match the requirements of electronic newsgathering (ENG) crews, independent filmmakers, documentary producers, event videographers and military agencies. The XF300 also offers multiple recording bit rates, resolutions and variable frame rates to expand your creative flexibility, and allow you to work in virtually any production environment. And complete customization over the image, display and operation makes the XF300 a camcorder that can be tailored to fit your individual needs. MPEG-2 compression is both highly reliable and versatile. Developed by the Moving Pictures Expert Group (MPEG), it is one of the most widely used compression schemes in the industry for camera acquisition, over the air broadcast, cable and satellite TV. 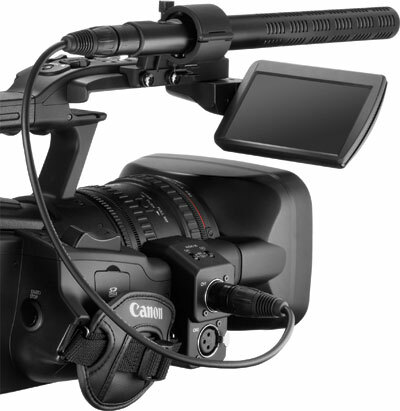 Canon’s adaptation of MPEG-2 for the XF300 Professional Camcorder, named the Canon XF Codec, ensures the widest compatibility with existing industry infrastructure and non-linear editing (NLE) systems. As well, by using an MXF file wrapper, video and audio can be wrapped in a single file along with important metadata. The XF300 supports the highest HD quality with Full HD 1920x1080 resolution, up to 50Mbps bit rate and 4:2:2 color sampling. 4:2:2 color sampling provides twice the color resolution of HDV and other codecs that use 4:2:0 color sampling. 4:2:2 provides ultra-fine transitions in tone and color and maintains the highest quality image for use in post production processes such as chroma keying, color grading, advanced compositing and effects. The codec’s 50Mbps constant bit rate provides the bandwidth needed to capture the XF305’s superior resolution and color in spectacular detail. Perfect for news crews and live event shooters, the camcorder CONTINUOUSLY buffers approximately three seconds of video in memory. When the Record button is pressed, recording begins and the contents of buffer memory are added, so you never miss an important shot. File based recording facilitates workflow by reducing transfer times when moving video to non-linear editing (NLE) systems. Additionally, metadata can be input at image acquisition and imagery may be reviewed immediately after recording to ensure every shot is captured and logged CORRECTLY. 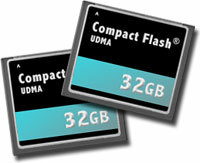 The following compact flash cards have been tested by Canon and are COMPATIBLE with this product. * Fully operational in all modes. ** Fully operational in all modes with Firmware Version 1.0.1.0 upgrade. Click the Drivers &; Software tab above to DOWNLOAD the most up to date firmware. *** Not operational when using SLOW motion modes. Canon’s XF Codec is supported by the industry’s leading manufacturers: Adobe, APPLE, Avid and Grass Valley. This ensures the widest compatibility with existing infrastructure and non-linear editing (NLE) SOFTWARE. the clips cannot be used in Final Cut Pro if Native is selected in the “Transcode to” (“Target Format”) column. Select instead one of the ProRes422 options. B In the Log and Transfer window, relay clips (clips recorded spanning two or more CF cards) are not handled as one clip but are instead treated and ingested as separate, independent clips. C When ingesting clips with Native selected in the “Transcode to” (“Target Format”) column, a name other than Canon will appear in the Compressor field. However, the clips will be correctly ingested. Clips that were recorded using the 50Mbps (4:2:2), 1280x720, 24P video configuration cannot be used with Avid Media Composer 4.0.5/5.0.0 &; NewsCutter 8.0.5/9.0.0. Clips recorded using the 25Mbps (4:2:0), 1440x1080, 30P video configuration will be treated by Avid Media Composer 4.0.5/5.0.0 &; NewsCutter 8.0.5/9.0.0 as 60i clips. To edit as a 30P project, please use clips recorded using the 50Mbps (4:2:2),30P, or 35Mbps (4:2:0), 30P video configurations. When linking MXF files using the Link to AMA File(s) menu option, a name other than Canon may appear in the Video properties. However, the clips will be correctly linked. Inspired by the same high level of optical precision used in Canon broadcast and photographic lenses, the Canon XF300 Professional Camcorder incorporates a Genuine Canon 18x HD L-Series lens that features a wide and impressive zoom range of 29.3 – 527.4mm (35mm equivalent). The lens incorporates High Index – Ultra-low Dispersion (HI-UD), Ultra-low Dispersion (UD) and aspherical elements to minimize chromatic aberration while delivering a resolution of 1,000 TV lines. In Full Manual Mode, the lens features mechanical stops for both the zoom and focus systems. Mechanical (Hard) end stops ensure that repeatable and dependable focus and zoom can be achieved when manually turning the lens barrel. These mechanical stops also allow for compatibility with many third-party remote camera controllers that require end stops in order to calibrate themselves. 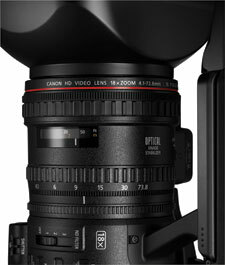 Additionally, display distance indicators on the lens barrel allow the operator to easily set the desired focus distance and move between focus points while recording. For ENHANCED versatility and durability, the lens is equipped with three built-in glass, neutral density (ND) filters (¼, 1/16 and 1/64) and a six-blade metal aperture iris. The XF300 also incorporates a newly designed SuperRange Optical Image Stabilization system (lens shift) with three modes: Standard, Dynamic and Powered. Lens shift is controlled so that the maximum compensation angle is constant from wide angle through telephoto. Stabilization changes throughout the zoom range to minimize more pronounced shaking. This is especially useful at wide-angle focal lengths when walking. When shooting high definition video, sharp focus becomes more critical than ever. Canon's proprietary Instant AF system combines an external AF sensor with Canon's legendary auto focus system for fast and accurate focus. Together, the two sensors reduce focusing time - even in low-light, low contrast, or high brightness situations - and improve focusing performance on difficult subjects. Instant AF changes focus as rapidly as possible and is designed for applications in which quick focus is more important than other considerations - for example, in news gathering or documentary work. Optically MATCHED for the XF300’s HD lens, the WA-H82 Wide Attachment increases wide angle capability to approximately 24mm (35mm equivalent), while maintaining the versatility of a 4X zoom range. * Instant AF is not possible with the WA-H82. Newly designed and manufactured exclusively by Canon, the XF300 Professional Camcorder incorporates three native 1920 x 1080 CMOS Image Sensors, which deliver outstanding Full HD video recording with minimal noise. These 1/3-inch sensors enable a compact lens and body design, for greater mobility and quick shooting. Multiple recording modes, resolutions and frame rates make the XF300 Professional Camcorder creatively flexible and able to work in virtually any production environment. From the highest quality 50Mbps Full HD, to the HDV compatible 25Mbps, users will find the camcorder capable of taking on any JOB. 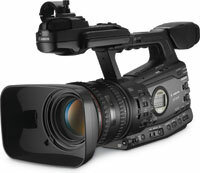 The XF300 Professional Camcorder offers a full RANGE of selectable frame rates. You can choose between 60i, 60p, 30p and 24p settings to achieve just the look you want. In addition to the standard interlaced frame rate of 60i, the XF305 is able to capture at 60p. 60p is rapidly becoming the standard for fast-action sports. 30p is the ideal frame rate for video viewed on THE INTERNET. It is also an excellent choice for frame grabbing during playback. 24p matches the frame rate of a traditional film camera giving the same cadence and temporal motion needed for a "film look." For added versatility, XF300 can be customized to record in both 60i/50i, 60p/50p, and 24p/25p (this optional upgrade must be performed by a Canon Factory Service Center). Slow and Fast Motion Modes allow the XF300 to record a different frame rate than the playback frame rate, resulting in either a fast or slow motion effect during playback. Since the camera is recording real frames and modifying the playback rate, there is no quality loss and maximum image quality is maintained. In 1080 mode, fast motion is supported up to 2.5x the normal rate and as slow as 1/2.5x. In 720 mode, fast motion is supported up to 5x the normal rate and as slow as 1/1.25x. With this feature, users can program the camera to record a specified number of frames at specified intervals. The technique can be used to observe natural phenomena over extended periods, making it ideal for time-lapse APPLICATIONS. The interval can be set in 25 levels ranging from 1 second to 10 minutes. 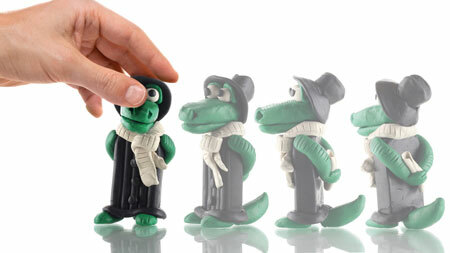 This setting allows a specified number of frames to be recorded – ideal for projects such as clay animation. The XF300 Professional Camcorder features Canon's powerful DIGIC DV III Image Processor, which provides ENHANCED shading, lifelike tonal gradations, new custom picture settings and lower power consumption. 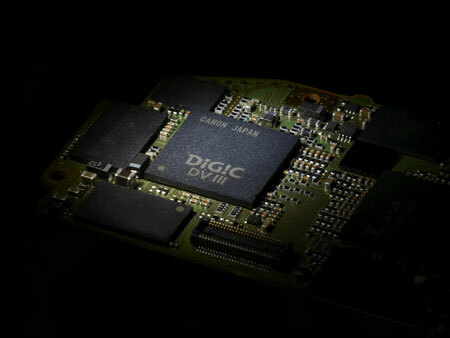 DIGIC DV III is also the high-speed engine which powers Genuine Canon Face Detection. On-the-go videographers will appreciate the ability to track one subject in a crowd of people. 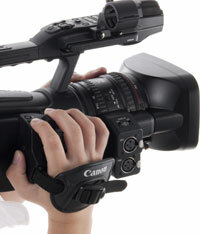 The XF300 Professional Camcorder has set a new standard for ergonomic design in compact pro camcorders. It is designed from the ground up to maximize handheld shooting comfort and usability. Users will find the camera well BALANCED with the handgrip positioned closer to the optical access near the camera’s center of gravity. This allows the operator to easily maintain a steady shot while minimizing arm fatigue. Controls are ideally placed making the camera feel like a natural extension of the operator’s body. 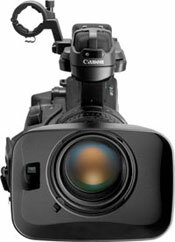 Additionally, the XF300 features a redesigned layout to make using the camcorder highly intuitive. New users and users switching from other products will find the button layout, camera menu system and camera controls immediately familiar and easy to use out of the box with operational and control organization that conform to industry standards. A 4.0-inch, 1.23-megapixel LCD monitor provides a large, accurate area for critical focus confirmation and approximately 100% field of view. The display is freely rotating- able TO OPEN on both the right and left side of the camera body. The display also features an additional 35º of forward movement past normal position. The large range of movement makes the display adjustable for easy viewing even in the most difficult shooting positions. The flexibility and fluidity of movement also makes the display less susceptible to accidental damage, compared to a more rigid design, if bumped during recording. The XF300 Professional Camcorder features a 0.52-inch, 1.55 Megapixel Color EVF and approximately 100% field of view coverage for comfortable viewing and accurate judgment of composition, focus and color. The angle of the viewfinder is adjustable for additional user comfort and when using the LCD display for monitoring. The EVF can be used as a cheek pad to ensure three points of contact when hand holding and maximizing stability. This makes the camcorder much easier to manage during extended recording periods and long days of shooting. Two peaking modes and a magnify focus assist function are available in standby and record mode (LCD monitor and EVF), making it extremely easy for the XF300 operator to check and confirm critical focus. Users of the XF300 Professional Camcorder have full manual control of all camera functions to adapt to both technical and artistic challenges when shooting. For maximum customization, users have access to Custom Picture Settings, Custom Functions and Custom Display Options to tailor the camera to match their creative and production needs. Any combination of these items can be saved to an SD memory card for easy SETUP and matching of multiple XF305 and XF300 camcorders. You can manually set an extensive variety of image quality adjustments and store them as 9 different presets. 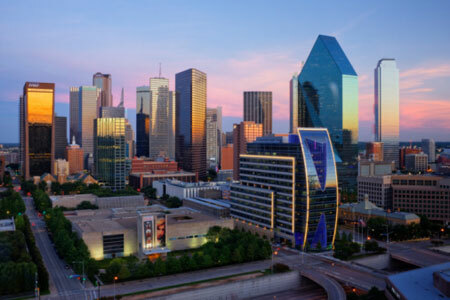 The adjustments include: Gamma, Black Level, Black Gamma, Low Key Saturation, Knee, Sharpness, Noise Reduction, Skin Detail, Selective Noise Reduction, Color Matrix, White BALANCE, Color Correction and Setup Level. The XF300’s operation can be further fine-tuned through the use of Custom Functions. This allows the camcorder to truly match your shooting style. A total of 12 unique items can be adjusted including: Shockless Gain, Shockless White Balance, AE Response, Iris Limit, Iris Ring Direction, Focus Ring Control and Character Record. As well, for quick access to commonly used functions, the XF300 features 13 customizable control buttons. The Custom Display function lets you set 32 display items to create a custom LCD/EVF to suit your specific needs. Items that can be selected include: ZOOM Position, Audio Level, Remaining Record Time, Exposure, Object Distance, Time Code and more. 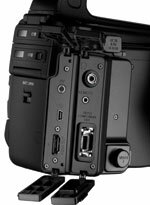 Understanding that accessibility to media is an important part of any file-based workflow, the Canon XF300 Professional Camcorder records to cost-effective Compact Flash (CF) cards, not proprietary media. The XF300 uses Material Exchange Format (MXF) for its file structure -an internationally standardized container format for the exchange of video and audio material. Using the MXF format, video and audio can be wrapped into a single file along with important metadata. With MXF, the XF300 will not only benefit from the highest level of compatibility with NLE systems, but also with high-end network systems used by many networks and production studios. A stereo microphone is incorporated into the XF300 Professional Camcorder, as are two XLR audio inputs with +48V phantom power. The built in microphone provides exceptional audio in fast-paced situations while the XLR inputs provide CONNECTIVITY TO external microphones, and other professional audio devices. If you choose, the built-in microphone and XLR input can be used simultaneously. Audio is recorded in 16-bit PCM format at 48 kHz for amazing quality and fidelity. 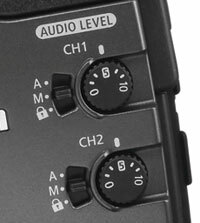 And both the built in microphone and XLR inputs have the option for automatic or full manual gain control. To prevent variations in the recorded audio level, the dial can also be locked. The XF300 also includes a 3.5mm headphone terminal with 16 volume settings for accurate audio monitoring. Videographers depend on these features to confirm accurate exposure and color levels during the capture process. Typically only found on expensive external units, the Canon XF300 Professional Camcorder has a waveform monitor and vectorscope built right into the camera. The waveform monitor shows a detailed view of overall image brightness and RGB components. The onboard vectorscope provides real-time image hue and saturation analysis, making it easy to check color balance and see the result of white balance adjustments. 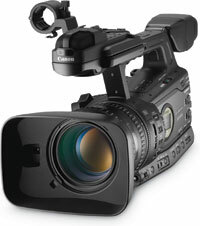 The XF300 Professional Camcorder is compatible with Canon’s new BP-955 and BP-975 Intelligent Lithium-ion batteries. These batteries communicate remaining running time (down to the minute) and wear data back to the camcorder, so the user is well-informed at all times. On the outside of the battery, four LED lamps allow battery life to be viewed quickly when in the field. 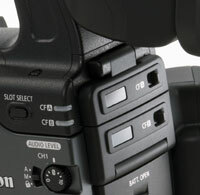 Additionally, the camcorder is compatible with existing Canon BP-900 series batteries. Batteries can also be inserted and removed while the supplied AC power cable is connected. For applications such as storyboarding, CONTINUITY and publicity shots, the XF300 offers the ability to capture 1920 x 1080 still images. Photos may be captured to an SD memory card during the time of recording, as well as “frame grabbed” during playback. German, Spanish, French, Italian, Polish, Russian, English, Chinese (simplified) and Japanese.